If your plan is to make big profits with your Nebraska small business, then buying a Nebraska businesses database is a must. The Nebraska business directory will provide you with all the info necessary to take your company on the road of success. You can use this database to make new business deals, explore the market, learn about possible obstacles in time to circumvent them easily, promote your brand, etc. Unfortunately, the things we’ve mentioned above are not possible with every list of Nebraska companies. You need one that contains a huge number of entries, all of which are real and up-to-date. The problem is that many data miners are just looking to make quick money, which is why they don’t check the data in their directories. Because of that, such business databases might be worthless. Knowing that, it’s crucial to buy a real database with regularly updated info, as that’s the only way to take your business to the next level. So, how are you supposed to get a hold of such database? The answer is – easily, by buying the one that we offer! For Nebraska Companies database, we have a total of 94,745 Nebraska businesses listed. Compiled Listing of Nebraska Businesses and Companies in Excel Format. Usage: Nebraska Business Search, Nebraska ​​​​Business Entity Search, Offline Marketing, Sales Lead Generation, B2B Partnerships and other Business related purposes. Our database comes in the form of an XLS/CSV file, which can be opened with Excel or a similar program for sheet documents. Once you open the database, you will be able to use the data in any way you want. For example, you can do a Nebraska business entity search. Instead of going through all of the 94,745 Nebraska businesses listed in the database, you can simply use the Find option and type in the name of the specific company. 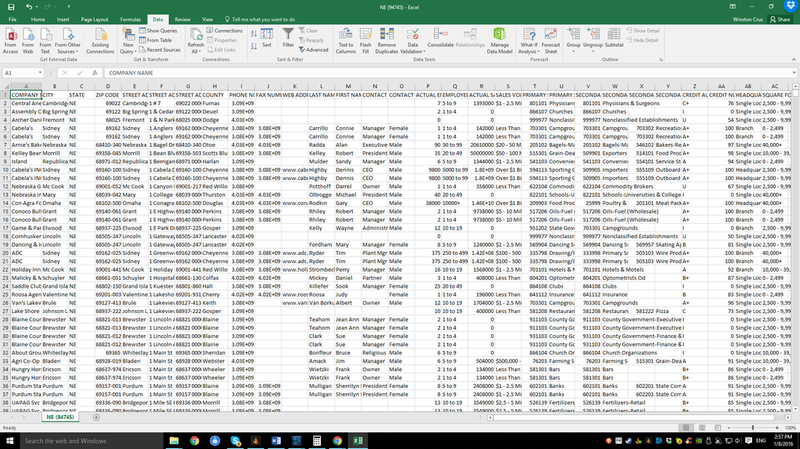 You can also sort the data according to different criteria, such as the city I which the company is based, ZIP code, the number of employees, actual sales, SIC industry code, etc. On top of that, the directory also features contact details of the Nebraska companies. Those include their telephone and fax number, email address and website URL, as well as the mailing address. How to Use the Database to Benefit Your Company? ​Because it comes with a huge number of different details, our directory can be used for all kinds of purposes. First of all, you can use it to see how your company fares on the current market. You will learn more about your competitors if you study this list. Another use of the database is for making new partnerships. The details in the database allow you to find your perfect business partners, after which all you will need to do is send them a proposal. Again, this is something in which our directory can help you – you can get in touch with the people from those companies by using the contact details from the database. The final use of the details from the list is actually the main reason why people decide on buying it. We’re talking about the promotion of your brand. You can use the details from the directory to launch a superb marketing campaign, whether it’s based on sending emails, calling people on the phone, or sending brochures. Try using our Virginia, Wisconsin, Florida databases for fast and excellent networking as well.